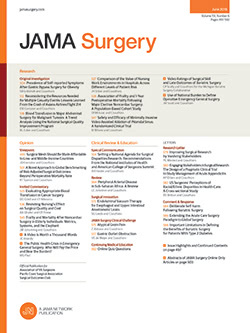 In the Original Investigation titled “Association Between Smoking Status, Preoperative Exhaled Carbon Monoxide Levels, and Postoperative Surgical Site Infection in Patients Undergoing Elective Surgery,”1 published online February 15, 2017, there were errors in Table 1 and Table 2, Figure 2, and the text. In Table 1, the last column heading should have been “SSI Cases” and in that column, the percentage for the 1855 individuals who were not smokers should have been given as 75.7%. In Table 2, the first row heading should have appeared as “First Analysis (SSI Cases and Controls With Available Smoking Status).” In Figure 2, the y-axis label should have been “Frequency.” In the Determination of Smoking Status subsection of the Methods section, the date in the first sentence should have been “December 2009,” and the inclusive dates in the last sentence should have been “January 1 and December 1, 2009.” In the Additional Contributions section, the following sentence should have appeared: Adam Jacob, MD (Mayo Clinic, Rochester, Minnesota), obtained the exhaled carbon monoxide level data from the electronic medical record. Other typographical errors were corrected in the text as well. This article was corrected online.